Pashtun, February 7: Creating a space of hell in the country, Pakistan has always been at the realm of military force. The Pakistani military has been hammering the state with its dominance creating havoc and atrocities on the people. The Military force has ruled the country for roughly half of its 71-year history, of rights abuses, including a campaign of enforced disappearances and extrajudicial killings. 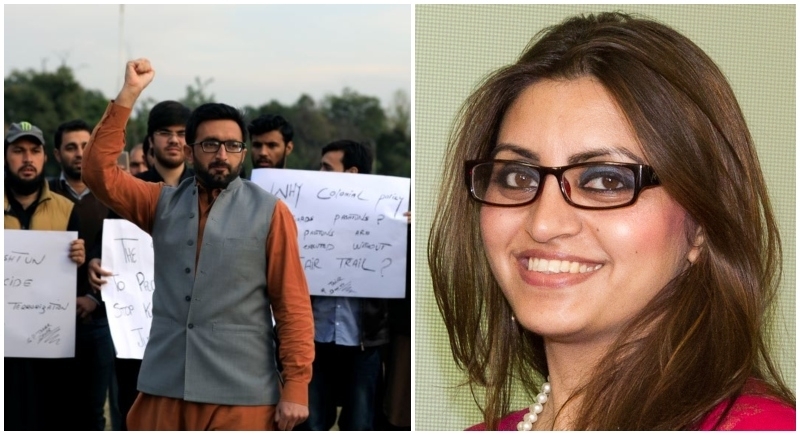 Pressurised by international groups, Pashtun rights activist Gulalai Ismail was been released by the police in Pakistan's capital Islamabad, a day after she was arrested along with 17 others for holding a protest in the city. International rights group asked Pakistani authorities to investigate the death of a human rights activist leader Arman Loni while in police custody and release other activists arrested for protesting his alleged killing. Gulalai Ismail was arrested from outside the National Press Club here on Tuesday while she was taking part in a protest against the controversial death of Pashtun Tahaffuz Movement (PTM) leader Arman Loni. She was illegally arrested with 17 others who were included in the protest. The arrests were described by rights groups as the latest round of repression of the PTM by Pakistani authorities. Gulalai Ismail contacted her father, Muhammad Ismail through Whatsapp messenger wherein she shared her location while being arrested and it showed she was being held at a police station. "The police behaviour with us was extremely unhelpful. They did not let us meet her, and they were very rude," he said, adding that police officials later told him that his daughter had been transferred, but did not disclose her whereabouts. On knowing further, it was highlighted that Gulalai and the 17 others were detained and charged with violating Section 3 of the West Pakistan Maintenance of Public Order (MPO), which gives the government wide-ranging powers to arrest people suspected of acting in a manner "prejudicial to public safety or the maintenance of public order". The Pakistani military force has been for years imposing its dominance on the people and has been associated with atrocities on the people. The law and order in the country is completely under the helm of these military forces. Many activists and people from restive Pakistan have been protesting against the inhuman and brutal act of Pakistan for years. Gulalai Ismail, a Pashtun and women's rights activist, was in 2017 awarded the "Reach all Women in War" Anna Politovskaya Award. In October, she was imprisoned at Islamabad airport on arrival in the country in connection with the peaceful protest in Karachi case.